Advances in information technology and data collection methods have led to the availability of large data sets in commercial enterprises and in a wide variety of scientific and engineering disciplines. We have an unprecedented opportunity to analyze this data and extract intelligent and useful information from it. The field of data mining draws upon extensive work in areas such as statistics, machine learning, pattern recognition, databases, and high performance computing to discover interesting and previously unknown information in data. 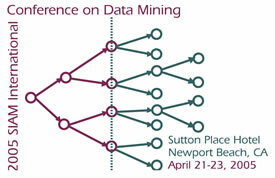 This conference will provide a forum for the presentation of recent results in data mining, including applications, algorithms, software, and systems. There will be peer reviewed, contributed papers as well as invited talks and tutorials. Best paper awards will be given in different categories. Proceedings of the conference will be available both online at the SIAM Web site and in hard copy form. In addition, several workshops on topics of current interest will be held on the final day of the conference. SIAM and the Conference Organizing Committee wish to extend their thanks and appreciation to Lawrence Livermore National Laboratory for its support of this conference.